If you'd like your book autographed by the author, please specify name. for an even more special present. 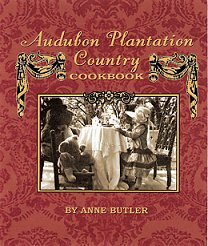 Pelican Publishing Company in New Orleans has just released River Road Plantation Country Cookbook by St. Francisville author Anne Butler. The big hardback book, with a multitude of images both old and new, concentrates on the picturesque region between Baton Rouge and New Orleans. It’s as much a state of mind as a place in time, this magical meandering roadway that follows the mighty Mississippi River to connect Louisiana’s two most significant—and most diverse—metropolitan areas. Only a book like this, celebrating the region’s unique culture and characters, crops and cuisine, can give the reader a taste of what life has been historically and still is today along the River Road. And only a writer such as Anne Butler, historian and storyteller who lives this life in one of Louisiana’s early plantations, could do it justice. Butler’s lessons in history and heritage are leavened by a light dash of humor, as she tells of the crown prince whose aversion to bathwater was matched by his daring in dining, serving turkey buzzard stew and fried toadstools to his horrified dinner guests, and the estimable Bernard de Marigny of New Orleans, at whose groaning dinner table were served snipe aged in the revered French tradition called “faisande,” ripened so long they dropped from their hangings (phew!). There’s even a recipe for Buggy Banana Bread, specialty of one of the state’s newest and most popular attractions, the Audubon Insectarium---and yes, it does contain crunchy crickets, an important source of protein in many communities worldwide. Of course recipes are given for more elegant fare—Smoked Molasses Ham, Oysters Bienville or Rockefeller Soup, citrus liqueurs and puddings made from the oranges and lemons brought over on Spanish sailing ships. The multistoried mansions of the French Quarter and the great antebellum sugar palaces of the River Road entertained kings and presidents and mighty warriors, and the lavish meals over which guests lingered for hours were unsurpassed anywhere, prepared as they were by sweating cooks over open hearths in outside kitchens and made of fresh ingredients purchased that very morning at the French Market or grown on the plantation. New Orleans, after all, has always been recognized as one of the great culinary capitals of the world, its historic development echoed in culinary practices bespeaking French and Creole, Spanish, Italian and German, African and Caribbean influences. In the Crescent City, it has been said, living is an art form, and so is cooking, just as much as architecture or painting or music. Baton Rouge cuisine, on the other hand, has traditionally been spiced up by political shenanigans and football fever in venues where the roar of the crowd is loud enough to set off seismograph warnings. Through fascinating text and stunning photographs both vintage and contemporary, Butler helps the reader pull up a chair at table beside the colorful characters who populated early Louisiana---toasting Andy Jackson at the banquet celebrating his victory in the Battle of New Orleans as recreated by renown Chef John Folse, hoisting a Ramos Gin Fizz with infamous Governor Huey P. Long or Champagne Punch with novelist Frances Parkinson Keyes, even sneaking a taste of Beer Bread baked by a nun of the Sisters of Charity order courageously caring for the lepers at Carville. At Magnolia Mound Plantation, Destrehan Plantation, the Hermann-Grima House and other historic sites, visitors today can observe traditional dishes being cooked in the time-honored way, though most of the recipes also have updated versions. 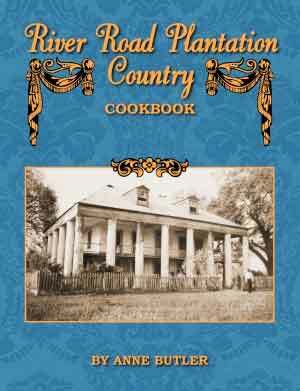 Whether treasured plantation family receipts or provided by professional chefs like Leah Chase of Dooky Chase Restaurant or Jeremy Langlois at Houmas House, the recipes in this book combine with the stories and the histories and the images to contribute to a deep understanding of the culture along the Great River Road from Baton Rouge to New Orleans, from the earliest days of colonial settlement to the present. There’s nowhere quite like it. This is the fourth in the popular series of gastronomic tour books on Louisiana’s culinary culture by author Anne Butler. 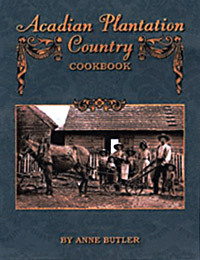 The others are Audubon Plantation Country Cookbook (named Best New Cookbook of the Year by Louisiana Life when first issued), Bayou Plantation Country Cookbook and Acadian Plantation Country Cookbook. Besides writing about history and heritage, Butler also writes crime books, including the Pelican release Weep For The Living. The splendid contemporary images enhancing the text in this book were shot by Louisiana photographer Henry Cancienne. Hardback. Available in bookstores everywhere; also available from pelicanpub.com or from Butler Greenwood Plantation website. Third in a series of wonderful big hardback history books filled with vintage photographs and a huge number of recipes, this book spans the centuries and the culinary heritage of Louisiana's Acadian Country, from the romance of Bayou Teche through the prairie vacheries, from the salt mines of Tabasco country and fishing villages along the coast to the French-speaking oldsters two-stepping to Cajun fiddles at the Liberty Theater. Reassembled villages like Vermilionville host fascinating living history demonstrations, but you can see living history everywhere you look in this area, and this book includes it all. Hardback. Available in bookstores everywhere; also available from pelicanpub.com or from Butler Greenwood Plantation website. Called a veritable social history in the guise of a cookbook, this book is the second in a series published by Pelican Publishing and picks up where Audubon Plantation Country Cookbook left off. Down the west bank of the Mississippi River and along Bayou Lafourche to the coast at Grand Isle, it includes the histories and vintage photographs and related recipes from the big plantations like Nottoway and Oak Alley, Southdown and Laura, as well as the lesser known ones. It features chefs and cooks from world-famous John Folse to Spuddy of Spuddy's Cajun Foods and 92-year-old Ms. Aline Foret who won the dance contest at the Abbeville Omelette Festival just a few years back and says we might not all be stars but we can twinkle!--and boy can she cook! For those who lost Grandma's recipe books in floods or storms, chances are they'll find them right here. Hardback. Available in bookstores everywhere; also available from pelicanpub.com or from Butler Greenwood Plantation website. 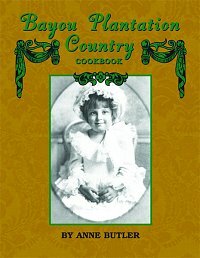 The best gastronomic tour of the culture and history, livin' and dinin' in English Plantation Country in Louisiana and Mississippi, Anne's well-loved old More Than A Cookbook has been re-released by Pelican Publishing Co. as Audubon Country Plantation Cookbook. Order online from pelicanpub.com or look for it in bookstores everywhere.